Ancylostoma caninum, a type of hookworm, attached to the intestinal mucosa. Credit: CDC's Public Health Image Library, Image #5205 (2007). Over the last decade, it's become clearer than ever that bacteria in the human gut— collectively termed the microbiome—play a key role in health and disease. 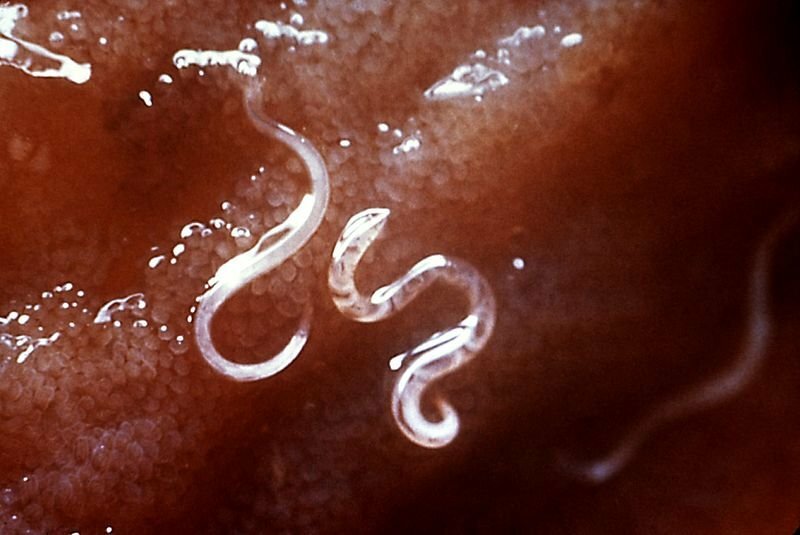 Now, researchers reporting in PLOS Neglected Tropical Diseases have shown that a subset of people with soil-transmitted helminth infections have changes to their microbiome when treated for the infection. Soil-transmitted helminth infections are spread when parasitic worm eggs contaminate soil and food that is later ingested by people. 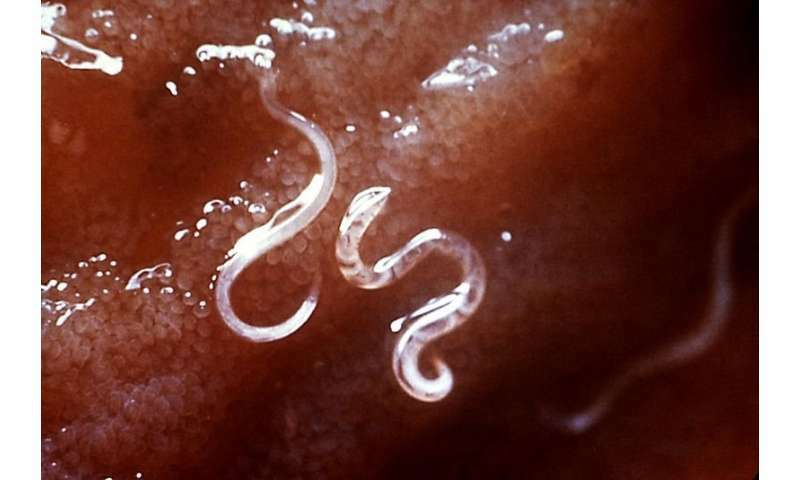 More than 1.5 billion people around the world are infected with these roundworms, whipworms, and hookworms, which can cause nutrient deficiencies, intestinal symptoms, anemia, and childhood developmental impairments. The infections are treated with anthelminthic drugs such as albendazole. In the new work, Ivonne Martin, of Leiden University Medical Centre, The Netherlands, and colleagues followed 150 individuals in Nangapanda, Indonesia, where helminth infections are endemic. Each person received either a dose of albendazole or placebo every 3 months for 2 years. Yearly stool samples were collected to assess helminth infection and take a snapshot of the microbiome, which was done before the study and at 21 months after treatment. Before treatment, no difference was seen in the microbiome composition of people who were infected or uninfected with helminths. Similarly, at the conclusion of the study, there was no overall microbiome difference between those that received albendazole and placebo. However, people who received albendazole but remained infected with helminths had distinct changes to their microbiome, specifically revolving around a decrease in Bacteroidetes and increase in Actinobacteria. "The microbiome composition is likely to change due to interactions between helminths and anthelminthic treatment, but a direct impact of treatment on microbiome composition has not been observed," the researchers say. "New statistical methods that allow longitudinal analysis of changes in the microbiome composition need to be developed."